Inkas Vehicles main objective is to be the ideal one-stop shop solution for both Armored Commercial and Military vehicles, alleviating the procurement process of using several vendors as a result of speeding up the entire supply-chain process. With over 1000 vehicles designed and manufactured in its Dubai Head Quarter since 2012, Inkas Vehicles latest product have caught the attention of professional with successful pre-orders. We look forward for an exciting year ahead. Ulugbekhon Maksumov runs one of the most largest factory in Dubai, specially designed to armored vehicles and cars. The Inkas Vehicles company is an armored vehicle manufacturing company licensed to operate in Dubai, United Arab Emirates. And he is ready to share his secrets of success. What did you start with? Was it easy to convince people to join your project? Born and raised in Uzbekistan, I worked as a Sales Manager in the automotive manufacturing sector where I gained experience and learnt the fundamental of sales, production process, management, procurement and logistics. I moved to Dubai in 2006 and established my first company Gulf Auto Trading, a one-stop-shop for all vehicles need, trading worldwide from the MENA region since 2008. Following the success of my first project and the potential I had foreseen in the armored vehicles manufacturing industry, I then opened the doors of my next projects: Inkas Group in 2008 and Inkas Vehicles in 2012 – set as the largest armored vehicles manufacturing factory in Dubai to date. I actually was approached to open businesses in the MENA region due to my professional reputation. I believe in the old fashion way: our customers are our friends, we build long term relationships – therefore I have always experienced a freedom that not many can afford. Could you, please, speak a bit more about the new vehicles developed by your company? During the first quarter of 2017, we have been focusing on the production of our APCs and luxurious commercial vehicles as we have successfully been awarded our 20th contract this year, including a large quantity in excess of 50 vehicles to be delivered to government in Africa. Suited for SWAT, Border Patrol, law enforcement agencies and military operations and designed for Military operations in challenging combat zones, the Inkas Titan-D APC is the latest variant of the Inkas Titan range of military vehicles which includes the Inkas Titan APC, the Inkas Titan-V APC both built on the Ford F550 OEM chassis and the Titan-S APC which is a smaller version built on the Toyota Land Cruiser 70 series OEM chassis. We have developed two new Cash-in-Transit Vehicles with the latest Armored GMC Savana CIT vehicle being in high demand. In addition, luxurious commercial vehicles such as Mercedes, Maybach or BMW transporting the delegates and VIP guests have been produced in high quantity in 2016-2017 using the latest model of chassis. We are now in stage II – design and manufacturing of a new APC, based on a shorter OEM Dodge chassis, more compacted and allowing up to 8 personal, available for pre-order. What is your view of the changes in recent years with regard to armored vehicles market? The market is in constant evolution: more threats, more organized combined with either new technologies or a back-to-basic approach witnessed in the past years in Europe. The attacks appear to be close to unpredictable in the way they are being carried away. We saw new development of technologies in regards to certain protection levels, materials as well as the development of upgradable components in regards to the performance, stability and maneuverability. Security systems such as vehicles surveillance, tracking and signal protection as well as ambushed detection systems are on the rise. During the course of the past 12 months, the market has been seen the demand moving over the APC “Armored Personal Carrier” vehicles which are military vehicles in our focused regions comparing to commercial vehicles. We also noticed an increased requirements for CIT vehicles which is the reason we developed 2 new Cash-in-Transit armored vehicles in a matter of 6 months due to client requests. We believe and have seen that being a one-stop-shop where we are able to source all requirements makes us more trustable within the market. This is a global trend we’ve seen and experienced with our clientele which is looking to deal with one company doing it all. Do you plan to export new vehicles to Asia and Europe and did some countries show an interest in buying? Our clientele is mostly based in the MENA region and Asia. We are expanding our target market with recent new projects based in Europe. West Africa is a market that has increased considerably within the past 12 months which has shown interest in our armored vehicles. We have the capacity to ship worldwide. What kind of future do you foresee for INKAS Vehicles in general? What could you advise your colleagues and partners, including us, in order to get better in our work? There are many paths that can lead you to success. However I believe into the achievements: success can come and go – whether achievements are what will set you apart as it will remain forever. I would recommend few key points to reach out to opportunities and turn them into a successful route. Be grateful of your journey 2. Be determined 3. Have faith: go after what you want and believe in what you can achieve 4. Making a major decision? Think twice, don’t rush 5. Success is a roller coaster: be ready to accept the challenge of ups and downs that goes along the way 6. Your team and entourage is a must: you need to surround yourself with people you trust. As I always say, if you want to go fast – go alone, if you want to go FAR – go together. The Titan-S is a 4×4 APC (Armoured Personnel Carrier) vehicle designed and manufactured by the Company Inkas, a global leader in the manufacturing of armored vehicles based in the United Arab Emirates. The Titan-S is the light version of APC in the family of Inkas Titan vehicles. The TITAN-S APC is build on a Toyota Land Cruiser 70 series OEM chassis offering spare parts availability as well as cost-effective maintenance and operating costs for military and security forces. The Titan-S is an ideal combat and security vehicle suited for SWAT team, border patrol and law enforcement agencies. The Inkas TITAN APC can be configured according to the customer’s requirements to be used as law enforcement, command post, reconnaissance, ambulance or medical support vehicle. The INKAS Titan-S APC can be fitted with a single-man open top turret mounted at the front of the roof with armour plates and bulletproof windows on 360°. The Titan-S can be also fitted with a remote-controlled weapon station armed with 7.62 or 12.7mm machine gun. The Titan Inkas APC can accommodate 10 people including driver and commander. The design of the Inkas Titan-S 4×4 APC is similar to the all family of Titan armoured vehicle with the engine at the front, crew in the middle and troops compartment at the rear. The vehicle can carry a total of 8 people including driver and commander, there is four seats at the front and four at the rear. There is two single doors on each side of the hull. There are 8 firing ports altogether, one in each of the side doors, two at the rear and a further two ports in the hull side. To increase the visibility of the troops, two bulletproof windows protected by metal mesh guards are available on each side of the hull. The Titan-S armour provides ballistic protection up to CEN Level B7, against firing of small arms using armor piercing 7.62x51mm ammunition. All the windows of the vehicle provide the same level of protection. The Titan-S has a gross weight of 4,820 kg and a length of 5.28 m, width of 2.18 m and a height of 2.85 m.
The Titan-S can carry a total of 8 people with four seats at the front and four at the rear. The Inkas Titan APC is motorized with a 4.2L V8 diesel engine developing 128 hp. at 3,800 rpm coupled to a 5 speed manual transmission. The Titan APC can run at a maximum road speed of 110 km/h and 60 km/h in off-road conditions with a maximum cruising range of 750 km. The Inkas Titan-S 4×4 APC can be fitted with a full range of equipment including emergency lights, police lights, siren and PA system, external video cameras, and more. Emergency lights, police lights, siren and PA system, external video cameras, and more. The Titan-V is a 4×4 APC (Armoured Personnel Carrier) from the family of Titan armoured vehicle developed, designed and manufactured by the Company Inkas Vehicles based in the United Arab Emirates. The Titan-V is built on the FORD F5500 Super Duty OEM light truck chassis. The main feature of the Titan-V is the use of V-shaped design to increase vehicle and crew survivability against the blast of landmine and IEDs (Improvised Explosive Device) explosion. 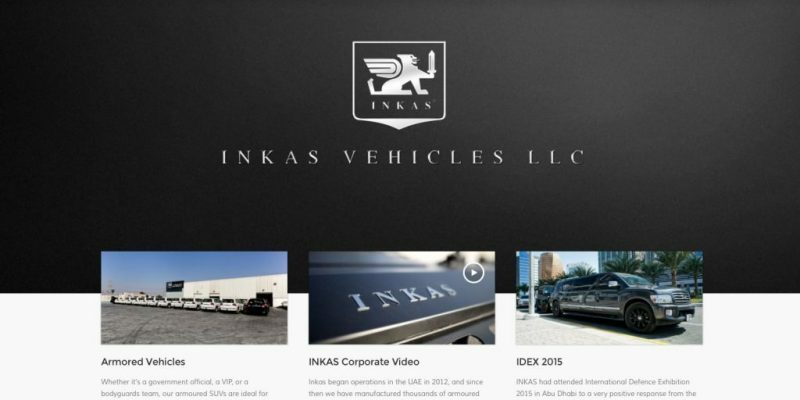 The Company Inkas Vehicles is a privately-held company that manufactures armored vehicles for military, security forces and private users. The company has its sales offices and after-sale workshops in Dubai as well as subsidiaries and sales offices around the world – notably strategic locations such as the crossroads of Asia, Europe and Africa. As all the modern armoured vehicle personnel, the Inkas Titan-V can be fitted with single-man open top turret which can be armed with 7.62mm or 12.7mm machine gun. To increase the protection of the gunner, the turret is fitted with armour plates on 360° offering the same level of protection as the hull of the vehicle. The armour plates of the turret can be fitted with small bulletproof windows to improve 360° view under protection. A remotely operated weapon station can be easily integrated according customer requirements offering to the gunner to operate armament from inside of the vehicle. The Inkas Titan-V can carry a total of 10 personnel with the driver and commander at the front and 8 people at the rear on individual seats. Driver and commander have a side door that opens to the front, with a bulletproof window in its upper part. The troop compartment is provided with 4 bulletproof windows and firing ports in the sides and two at the rear. There is also two large doors in the rear of the hull. One escape hatch is available at the rear of the roof of the vehicle. The engine is located at the front of the vehicle. All the windows of the vehicle are built to withstand the firing of small arms 7.62mm machine gun and hand grenades fragments, they are also protected by metal mesh guards. The hull of the Titan-V provides protection CEN Level B6 against firing of small arms 7.62x51mm caliber. The Titan-V is designed on a V-hull to increase vehicle and crew survivability by deflecting an upward directed blast from a landmine ort IEDs (Improvised Explosive Device) away from the vehicle. The Titan-V has a gross weight of 8,600 kg and a length of 5.95 m, width of 2.33 m and a height of 2.94 m.
The Inkas Titan-V is based on a FORD F5500 Super Duty OEM 4×4 light truck chassis The power pack consists of a 6.7 Liter Power Stroke V8 Turbo Diesel engine developing 330 hp. at 2,600 rpm coupled to an 6-speed automatic transmission with Select-Shift. It can run at a maximum road speed of 100 km/h and 60 km/h in off-road conditions with a maximum cruising range of 1,000 km. At IDEX 2017, the Inkas Titan-V was equipped with one recovery winch mounted at the front of the vehicle, LED lights on the roof, and lighting system inside of the troops compartment. According customer requirements, the Titan-D can, be easily customized with a wide range of equipment including external video cameras, GPS antenna, run-flat system, day/night long distance observation camera, Fire extinguisher , Battle Management System and more. Self-recovery winch, antennas, LED light, inside lighting system. In option, external video cameras, GPS antenna, run-flat system, day/night long distance observation camera, Fire extinguisher , Battle Management System and more. CEN Level B6 ballistic protection. Inkas Vehicles – a manufacturer of armoured transport and special purpose vehicles based in Dubai Investments Park (DIP), will set up another manufacturing facility in the business park at an investment of Dh55 million, said a press statement. The new facility will be the biggest-of-its-kind in the region, spreading across 159,700 square feet within DIP 2. 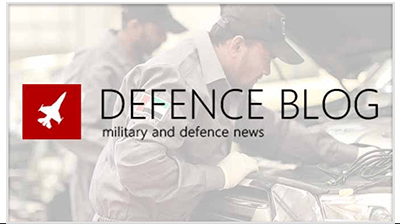 The business park already hosts four armoured vehicles manufacturers from across the world, which includes Inkas Vehicles, Mezcal Security Vehicles, Shell Armored Vehicles and Saxon Armor – producing a total of 1,600 armoured vehicles every year. Some of these companies are fast expanding their presence with additional manufacturing units within DIP, as the Middle East and North Africa is registering a sharp growth in armoured vehicles sector. This growth and expansion comes amidst a surge in global armoured vehicles market, which is projected to reach $28.62 billion by 2019 with primary drivers being the Middle East, North Africa and Asian markets. 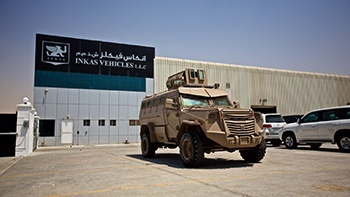 Inkas currently operates a 110,000 square feet manufacturing factory, producing over 1,000 quality armoured transport, executive SUVs, armoured cars, luxury sedans and special purpose military vehicles every year, and catering to the UAE and exported to Middle East, North America, North Africa & Asian markets. Accommodating the production of up to 50 vehicles per month in the UAE, 40 vehicles in Canada and 20 vehicles from an additional service workshop, Inkas turns around large orders in limited timeframes with its engineering and design capabilities. Since its inception, DIP has attracted over 3,500 companies across a wide array of sectors.